People born in October have it all. They get to have a birthday party at the peak of pumpkin spice and sweater season, and they can celebrate to the dulcet tones of Bobby Picket singing, “The Monster Mash.” As if that wasn’t enough to make everyone else jealous, they also have an almost startling level of birthstone variety. It’s not because they have two birthstones: they’re not alone there, since November and March also double up, and December and June go all out with three. It’s that both of October’s birthstones – opal and tourmaline – have an almost unparalleled level of variety in their look and color. If you or someone in your life has an October birthday coming up, here’s a quick guide to these incredibly diverse stones. 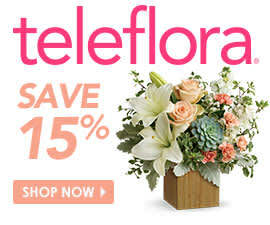 Teleflora offers chic bouquets perfect for October birthdays. If you could make a rainbow solid, it would probably look something like an Opal. In fact, that’s one of the mythological sources of the stone: In Indian lore, the Goddess of Rainbows turned to stone to avoid the romantic advances of other deities, and thus Opal was created. Looking at the stone, it’s no wonder it has such a fantastical mythos surrounding it. Opals come in a range of colors, although they all share some traits in common. Opal almost always has an iridescent sheen, with bright flashes of color from all across the rainbow. They also usually feature patterns, with large blocks of color popping out from the base shade. Because Opal isn’t a crystal, it’s usually polished to have a smooth, rounded finish. This smoothed face lets the shimmery aspect of the stone really stand out, and is the preferred look for opal jewelry. Opal isn’t a very dense stone, so pieces made from it are light and easy to wear. A note, however: Opal is fairly delicate relative to other jewelry stones, and can be easily scratched. Treat any opal jewelry with lots of care. When gifting a piece of opal jewelry, consider pairing it with a matching bouquet. White opals will go well with Teleflora’s Written in the Stars bouquet, and fiery opals will shine alongside the Southern Belle bouquet. Once again the picture of variety, Tourmaline’s looks are so varied it’s almost hard to describe. This is because it’s a fairly complex gemstone, and unbelievably tiny changes in its structure produce wildly different colors. It’s rare for even a single stone to be a single color through out: usually different colors can be found in layer or bands through out the gem. One common type of tourmaline is the watermelon tourmaline, which has bands of green, white and pink. The stone’s coloring gets even more complicated from there. Many tourmaline gemstones also change shades depending on the light or the angle at which you view them. This means your piece of jewelry might have a completely different look indoors and outdoors. For some people, this is a disadvantage, but others love the stone’s chameleon-like affect. If you’re giving someone a ring or necklace with tourmaline, you’re celebrating the many nuances of who that person is. You can continue to celebrate those nuances by matching the gem up with a similarly colored bouquet: For example, a watermelon tourmaline would look great next to Teleflora’s Kensington Gardens bouquet. Alternatively, you could match it with a vibrant, multi-colored bouquet like the Fancy That bouquet, to match the tourmaline’s many colors and shades. Whatever you pair this gemstone with, both the jewelry and the flowers are bound to impress.